In this episode, an invading snake Digimon catches the tamers off guard because they all somehow have better things to do. With Sandiramon's appearance, we are now squarely in the Devas arc. This arc is probably the weakest of the season, which speaks more to the quality of the season than anything else. But between the mystery and stumbling around that the opening episodes provide and the startling events in the Digital World, the Devas sort of get stuck at the bottom rung. It's unfair, but the arc boils down to a basic “monster of the week” affair and despite the rampant character development, there isn't a ton going on other than the parade of Devas marching in to die. It's an important arc, nonetheless, due partially to the aforementioned character development and partially to the sense of normalcy it generates. For everything that went on in the first thirteen episodes, it's still hard to say the tamers are accustomed to proper battle. Where previous fights were against chaotic neutral wild ones, the Devas are the legitimate destructive threat we're used to. These force the tamers to adjust their mentalities, accept that battle is justified and use evolution on a regular basis. In order to go forward, they have to go backward. This particular encounter illustrates just how unprepared they are for their new “save the world” gig. While Takato wants to search for emerging Devas, Henry and Rika are busy with real life stuff. Even Takato ends up distracted and playing in the park with his friends. That's not to say that the tamers should be forbidden from partaking in real life, but it shows that they haven't grasped their responsibility quite yet. 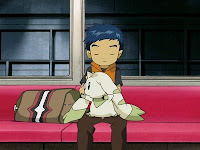 The Digimon are also culpable as Renamon leaves Rika alone, Guilmon gets sucked into the outing at the park and Terriermon outright asks for something interesting to happen, only to be reminded that interesting is violent and stressful in these parts. While Henry rescues Terriermon from Nurse Suzie and Rika gains new appreciation for Renamon thanks to Japanese theater, Takato's distractions provide the most important developments. 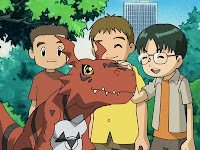 After Takato shows Guilmon to Kazu, Kenta and Jeri, word spreads until his whole damn class turns out to play with the him. 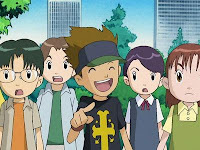 If you recall, just a couple episodes ago Takato was snapping at his friends that owning a Digimon was a serious responsibility and that he couldn't just play around all the time. Yet here, now that his fears about Growlmon have been resolved, he can't resist the call of popularity, shedding his duties to be the cool kid with the pet monster. As much as Takato claims to be dedicated to the task at hand, deep down he still wants to goof off with his buddy. 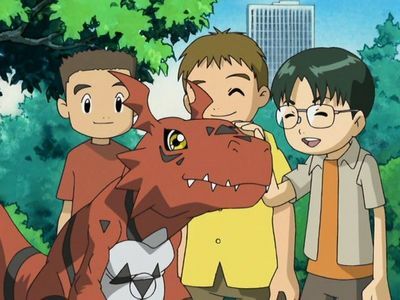 The sight of Takato and his friends playing with Guilmon is amusing in its innocence, even if it is coming at the expense of the task at hand. We almost never see recreation with Digimon in the real world (the only real example so far is Kari and Gatomon skipping a mission to enjoy the sun in an episode of Zero Two), and what's more shocking is all the kids freely playing along. Gone are the days when each and every one of those children would be pegged as a future digidestined. As much as the focus is on Kazu, Kenta and Jeri, what's really telling is the presence of Ayaka, Taizou, Tadashi and all those other kids you didn't think had names. The fact that these kids can knowingly observe, meet and interact with Digimon with no consequence and go right back to being background characters tells you just how far we've come from the first two seasons. As for the battle itself, Guilmon drills straight through the earth to the bottom and doesn't trip any electrical/gas/water/communication wires. Then Sandiramon dies after just a single hit from each of the three Champions. Then they all fly back up the hole Guilmon had just dug. Each is more stupid than the other one. I'm not sure why Suzie has come to refer to Takato as “that angry kid” but it's funny, especially when it sure ain't Takato who's angry about a 6:30 a.m. phone call. The dub loses points for refusing to allow silence when the kids show up at Takato's door, all smiling eagerly. In an effort to convey the point (despite it being immediately obvious moments later), Jeri speaks offscreen when the camera's on Kenta and vice-versa. The dub regains its points by brilliantly covering a joke that originally invoked the Japanese wives' tale that a sneeze means somebody's spreading rumors about you. Originally, Terriermon sneezed when Impmon referred to Digimon being dressed up and treated like a baby. In the dub, he sneezed and was afraid Henry would joke about needing to see Nurse Suzie. While anything involving actual conflict with Sandiramon wasn't at all interesting, the clever modify cards from Henry and Takato were. The best part, however, was the cell phone relay: Seiko is seen using the phone, then drops it. Rika picks it up, then throws it at Henry while riding by in a failed effort to call Takato, only for Henry to be accused of kidnapping Rika after the battle. Lost in all this is the pivotal role Impmon plays in getting Takato into the battle, all while keeping up his "I'm too good to associate with you pathetic morons" act. Until now, he's basically been a smug narcissist and an unpleasant pest, and the only good thing about him is, for all his bluster, how ineffectual he really is. This is the first time we see even an inkling of a moral compass out of him, doing something helpful for the three tamers, and the fact that he's still a smug narcissist and an unpleasant pest throughout (complaining about how disjointed the team is, insulting Takato for it, and then complaining about getting no thanks) is competent storytelling. This could be where Impmon's character development properly kicks off. Did anyone else get Devimon flashbacks with Sandiramon's taunt at the end of the battle? Both of them spend their last moments mocking the heroes (who just vanquished them) by pointing out how other villains will soon take care of them.